Studying abroad has always been one of my dreams since high school. I would always get fascinated by the idea of living in another country, learning and speaking another language, as well as sharing my culture and experiences with people from all around the world. In 2015, when I was already in my second year of university, I finally got the chance to live this experience. I was accepted by Illinois Institute of Technology to study at the School of Architecture for one year as part of the Brazilian Scientific Mobility Program, a government sponsored initiative that supports Brazilian students studying abroad. 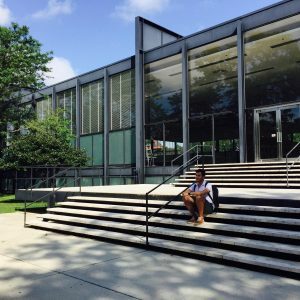 I was really excited about attending the School of Architecture at IIT because it is considered to be one of the best in America and also about living in the city of Chicago, which is known for its remarkable architecture works and also for being a city that provides its citizens such great urban life. I faced many challenges throughout my year of exchange. The toughest one was probably the language. Although I have attended English classes in Brazil, communicating in English in real daily life situations was something new and really exciting to me. Also, I was immersed in a very different way of living, behaving, thinking and relating to other people. All those facts made my experience at IIT highly contribute to my personal and professional growth. I am very thankful for having this experience. All the people, the school, the places I visited and everything I experienced will always be in my heart and memory. An exchange really is a life changing event.